Posted: Sun May 24, 15 3:48 pm Post subject: Bay bolete? From grassland running by a strip of hedge and mixed woodland. Smells nice! Cap slightly tacky to the touch. Is there anything nasty that has pores rather than gills? 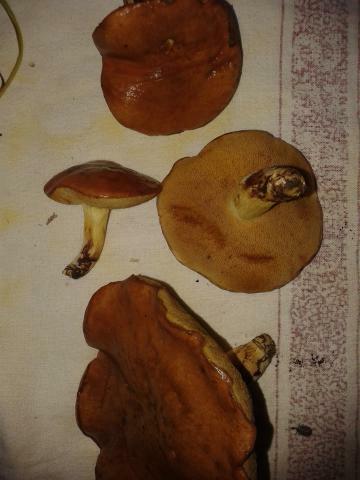 some boletes are better eating than others ,the good to eat ones need preparing according to what they are best at . Yeeeah there was a "devil bolete" that was red, and another one that this didn't match. 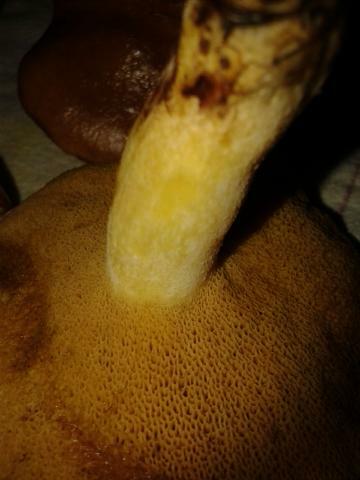 Edit - So is anything with these pores a bolete then? for online id tools i use roger's ..phillip's and then cross check with a simple google image search for the latin name . if it passes that to give a single plausible and edible id i recon i know what it is and it is dinner . not everything with pores is a bolete . It is not a bay bolete, it is a suillus.